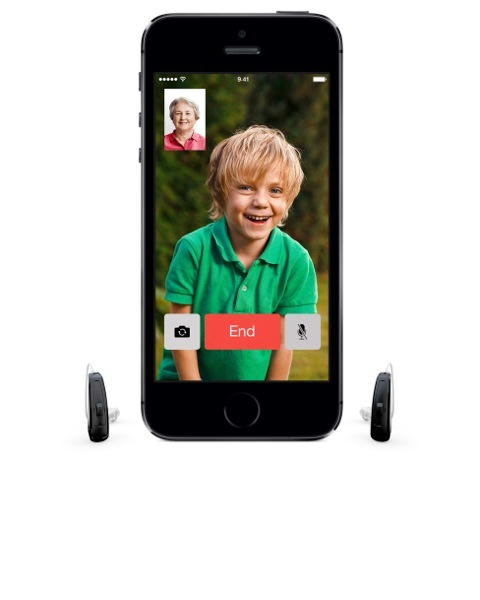 The first Made For iPhone hearing aid launched on Monday, courtesy of GN ReSound from Denmark. 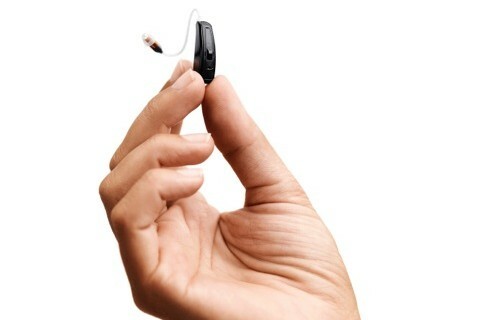 Dubbed the ReSound LiNX, the small hearing aid can also stream audio wirelessly when connected to an iPhone(s aapl), iPod touch or iPad. While there are other similar products on the market, ReSound LiNX doesn’t require a separate pendant or other remote-control accessory; it works directly with controls on an iOS device over a 2.4 GHz wireless connection and uses Bluetooth Smart technology. A companion iOS app controls volume but it can do a lot more than that. With it, owners of the ReSound LiNX can set geographic sound profiles such as more bass at home or greater mid-range sound response at work where background noise could be prevalent. The ReSound Smart App also includes a “Find My Hearing Aid” function to help find a misplaced unit. I’m impressed by so much functionality in such a small product. 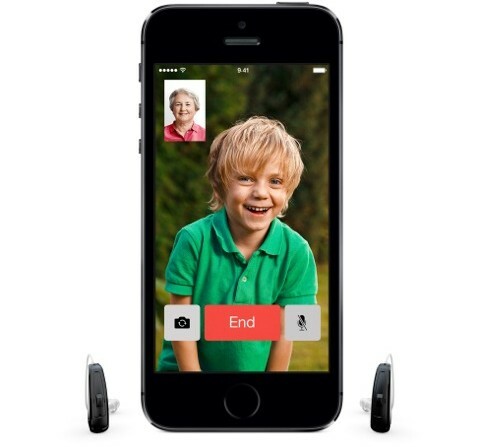 You can see in the video below that the ReSound LiNX is difficult to see when worn, yet it can be used to hear music, play games or have FaceTime chats in addition to providing a needed sound boost for normal, everyday hearing. glasses cost $75 to $150, hearing aids cost $2500-$5000. I think I have figured out why your company doesn’t routinely cover them. I just picked my ReSound Linx hearing aids up today. Man what a geek rush I must say. When I started looking for new hearing aids, I really wanted to have something that allowed direct integration with phones, microphones, etc. When I started seeing that most solutions required me to carry a new device in my pocket or around my neck, I really was turned off by the idea. Why? Because I already have a device in my pocket â€“ my iPhone. Why do I need something else? If you have an iPhone, do get the ReSound app for Linx. It has a demo mode that lets you play around with some of the things it can do. One of my favorite features is how the phone records the map coordinates of the last place it was when it connected with the hearing aids. So if you ever lose one, your phone can tell you precisely where it was when it last connected with them. As someone who lost a $2500 aid once, thatâ€™s a feature worth a lot. Itâ€™s worth echoing what Phil posted earlier. Hearing loss isnâ€™t an â€œold persons thingâ€ â€“ itâ€™s something thatâ€™s across all ages. And itâ€™s not always a â€œprofound deafnessâ€ thing. For me (with moderate hearing loss), itâ€™s not unlike how I need glasses. I could get around without them in theory, probably couldnâ€™t drive, could attend meetings at work (but forget reading that powerpoint screen), and probably wouldnâ€™t recognize people at a distance. Thatâ€™s basically my hearing loss â€“ about the same as what itâ€™s like needing glasses. Hearing aids are, for a lot of us, just glasses for our ears. Really spendy ones yes, but about as useful. Which brings one around to the cost ($2500-3000 EACH depending on model (yes, EACH)) as well as insurance not covering them. This is a big issue that companies providing insurance need to address via their policies. An an issue that employees need to raise with HR. If you have a job that provides insurance, and your HR doesnâ€™t provide coverage, go ask them why. Ask them how they can justify not supporting hearing aids, but can justify glasses (commonly covered). Ask them why they buy people glasses, and the answer will probably be, â€œWell people need to be able to see well to be a safe and contributing member of the work force!â€ Now ask them if thatâ€™s not exactly the same reason people need hearing aids. How and when can customers try it…. I signed up on their website but do not have this piece of information anywhere. The elimination of a pendant device is a great improvement for this type of setup. I used a MaxIt device a few years ago that had similar functionality, though it worked by linking my phone with my hearing aid via Bluetooth. But the pendant was inconvenient to wear and, worse, kept going on the fritz. Thanks for your comment, Phil. You are absolutely correct that hearing impairment affects people of all ages. Does anyone know the price of these? Wonderful device for seniors! And not to mention re-inventing how smartphones and listening devices can realistically improve the lives of our loved ones. Great for customers in need of assistive hearing devices.